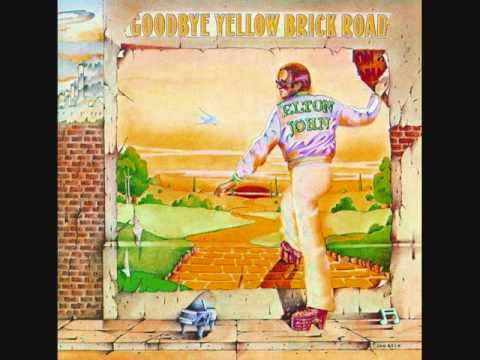 Somehow through all the bombast and pretensions (the stuff that makes Glam Rock great, frustrating and amusing all at once), the double-song opening to Goodbye Yellow Brick Road gives us Elton John at his ultimate peak. His voice is scathing, forgiving, bitchily snapping, chastising, and ultimately friendly. At intervals the work soars into realms not reached since 1969’s "Burn Down The Mission." “Funeral/Bleeding” foretells Progressive Rock’s moon-high combination of stinging lead and washboard rhythm guitar with layered synthesizer tracks that produced so many memorable songs. Queen’s “Bohemian Rhapsody” and “Fernando,” come to mind, as do some of Pink Floyd’s more dramatic works. But there is something much different about Elton's elided tracks. The long instrumental is a future imagining of the kind of music John wanted to have played at his funeral. The first half of the song opens with eerie wind effects – a moor, an ocean? It resolves into something that sounds like a buoy bell ringing. It continues with a synthesizer solo that is one part Beethoven’s Missa Solemnis (solemn mass), another part B-grade horror melodrama. 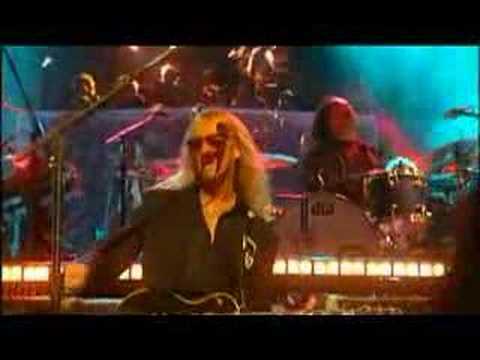 A minute-and-a-half into the song, John plays a meditative piano passage before the song bursts into flame. The ascent begins with a slow march a la “Pomp And Circumstance,” then flows seamlessly into a driving, Spanish Empire-inspired section with castanets firing up the rhythm, before it lunges headfirst into a classic Rock-N-Roll masterpiece. The synthesizer and Elton John’s piano hammer out and weld a sturdy undercarriage that is carried along on the wheels of Nigel Olsen’s hyper drumming, his set tuned in ideal sync with the otherworldly electronics of the song. Dee Murray’s bass is also a driver, but he must take a backseat to Davey Johnstone’s spear-sharp lead guitar, which is a major tour de force in the history of guitar leads and solos. Just as the listener believes the instrumental can go no further, the lyrics, (strictly speaking to another song, “Love Lies Bleeding), drop in from on high. Elton quickly exercises his full range. The musical meditation on death merges with a contemplation of the end of a love affair, a sort of living death itself. Sir Elton sings his guts out. It is easily the best vocal performance of his career. Except for the central image of the song, it is not one of Taupin’s typical verbal pyrotechnical efforts, but rather a simple sad song. It does hang together nicely. The love-lies-bleeding plant is a graceful, trailing plant with Hopi-red, pendant cones of blossoms. A quick look and one can see how it earned its nickname. It was very popular in Victorian and Edwardian times, often planted in remembrance of a love from one's youth, even long after the person doing the planting had married, had children and so forth. It is a “sentimental” plant, if such a thing exists. The chorus lyric offers little in the way of the unexpected. However, as the emotionally charged music builds, collapses and rebuilds, the lyrics take on a moodier sensibility. The singer/writer acknowledges there is still a “we” operating in the little drama. Faux Beatles’ background vocals make a pleasant, evocative addition, as do updated and elaborated Chuck Berry guitar licks. Finally, good wishes are sent down the wire, and, 40 years later we are also left to ponder a lost world of telegrams and wires in an ever-more wireless world. The haunting wind of the instrumental opening nearly 11 minutes earlier in the opening of the instrumental portion is tidily referenced. While Goodbye Yellow Brick Road is an uneven album, it poured out a handful of unforgettable hits. “Candle In The Wind” is now a light-pop standard; “Bennie And The Jets” is one of the finest reflections on early Rock-N-Roll, though it remains a novelty song, unfortunately. The album title track is a provocative look into the crossover that occurs between the silver screen and reality. It compares favorably with The Beach Boys’ “Disney Girls,” and Woody Allen’s film, The Purple Rose Of Cairo concerning the same question about the boundaries of media and the “real world.” None of the other songs of Yellow Brick Road achieve as much as the opening track, spiraling, as it does into high orbit. “Funeral For A Friend/Love Lies Bleeding” is a major genetic marker on the DNA of Rock-N-Roll. It easily earns its way onto a list that covers the greatest Rock songs of all time. Although “Funeral/Bleeding” was too long for singles-play radio, it received heavy airtime on the fledgling stations of AOR (Album Oriented Radio) and has been a concert favorite for over 40 years. The song has sold almost 40 million copies worldwide, including singles sales and through sales of Goodbye Yellow Brick Road.